Elizabeth von Hassell has served as the Executive Director of the National Sporting Library & Museum since December of 2018. Prior to joining the NSLM, von Hassell previously served as the Director of Development at James Madison’s Montpelier. In that capacity, she worked closely with Montpelier’s leadership on conservation and preservation projects. Before joining Montpelier in 2014, von Hassell worked at Shenandoah University and spent 25 years living and working between New York City and Clarke County, Virginia as a Vice President of Marketing in the pharmaceutical industry. She was born in Winchester, Virginia. She is a graduate of Hollins University. 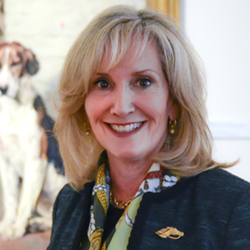 Von Hassell is currently on the Board of the Journey Through Hallowed Ground, Thoroughbred Retirement Foundation, and has served on the Boards of the Preservation Alliance of Virginia, Millwood Country Club, Long Branch Historic Plantation, Old Chatham Hunt Club, and the Lost Brigade Wounded Warrior Foundation. She has two sons, one a recent graduate of Woodberry Forrest who attends Rhodes College, and the other a graduate of Washington and Lee University who lives in New York and works in the solar industry. Von Hassell is an avid outdoor person, and enjoys riding, hiking, canoeing, fishing, shooting, and tennis.